Posted in Blogs & Social Media, Civil Liberties, Politics, Sarah Palin, Television. Tags: Betty Draper, Civil Liberties, Conservatives, January Jones, Liberals, Libertarianism, Mad Men, Mike Huckabee, Republicans, Sarah Palin. RSS feed for comments on this post.. TrackBack URL. 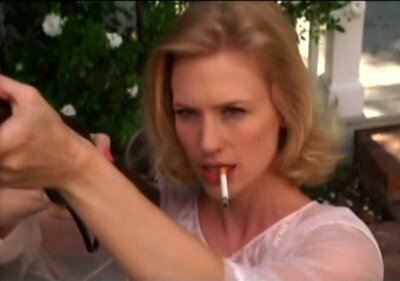 Well… While it is a cute comparison between Palin and January Jones, it is a bit unfair to try to pose a race between a woman who shoots against a fictional character. You know, this whole “reality-based community” thing. And, honestly, it’s hard to paint Palin as substantially more hostile to individual liberties than Joe (“I created the office of Drug Czar”) Biden. The 2012 Republican nominating process should be quite amusing. I think even more entertaining figures will be emerging in the next few years also — after every election people think about rematches, but life is (mercifully) rarely so static. Although I doubt any of the players will be credible voices for reducing government. Being fictional does limit the ability to support Betty Draper. A while back I did see a libertarian site claim that Sarah Palin is a real life version of Dagney Taggart so it isn’t totally off the wall to bring in fictional characters. Obviously this won’t work in terms of consideration for the 2012 nomination. While I certainly don’t agree with Biden on drug policy, there is really no comparison between him and Palin in terms of being awful on civil liberties. The vast majority of politicians are too conservative on drug policy. Palin goes beyond this in her attempts at censorship. I’m not aware of Biden ever putting pressure on a library to remove books on homosexuality because they offended his base, as Palin has. I agree that current support for Palin does not necessarily mean she actually will be the 2012 nominee. Losing VP candidates tend to do better in polls than in the nomination battle. Ed Muskie and Joe Lieberman were both early leaders in the polls, and both failed to win (altough under quite different scenarios). Having been on the previous ticket also did not help John Edwards. In this case I could see Palin get the nomination primarily because many others might decide to wait another four years if Obama remains popular, considering how difficult it is to beat a sitting president. While I highly doubt that Palin has any chance at getting the nomination, I do expect the contest to be one for the ages. If you think that the Democrats (to great help from Palin herself) did a great job making her look like a moron in two months, just think what will happen when other Republicans who understand the issues get a chance at attacking her. Democrats attacking her can be played off as simple partisanshi. I expect we will see some real fireworks when her own kind get a shot. If Stevens had eked out a win in November, he could have resigned and Palin could have appointed herself as Senator. This would have given her a national platform and a non-frozen locale. But he didn’t so she is stuck in the ultimate backwater. If I had to bet on a Republican nominee for 2012, I would put my money solidly on Romney. His gracious bowing out of the race rather early left no bad feelings. Also, a Presidential race needs, more than anything, organization. And if the Mormons lack for anything, it is not organization — as the Prop 8 campaign showed. The assumption there is that Palin’s main problem was simply inexperience. When she was first picked, my assumption was that she was an up and coming conservative who didn’t have much experience yet but who knew what she was doing and understood conservative positions. Once she began answering questions it became apparent that she’s a lightweight whose is unlikely to make a good political leader regardless of how much experience she has. Getting into the Senate and out of Alaska would give her more exposure to national issues, but that would not change her limited intellectual curiosity. Politically she might have done well going this route considering that this is the party which gave us George W. Bush, but she would still probably be as clueless on policy. For the conservatives who love her for who she is, it doesn’t matter if she is in Alaska or in the Senate. It is far too early to guess who will get the 2012 nominee. Romney does have the advantage regarding organization, but that wasn’t enough in 2008. The manner in which he bowed out didn’t leave any bad feelings, but he also did not have the support of large numbers of Republicans. How Romney does in 2012 will depend a lot on what he does the next few years. Possibly campaigning for other Republicans in 2010 will help him, especially if it is a conventional good year for the out of power party. It would also help him (or other potential candidates) if new issues arise where he can take a leadership role in opposing what the Democratic government is doing beyond simple Republican obstructionism. Factors we couldn’t predict now might have a major role in upcoming elections. Events such as 9/11 and Katrina had major roles in subsequent elections and any discussion at the onset of Bush’s first term wouldn’t have included these factors. Getting back to the initial question of support for fictional characters, besides pointing out the (misguided) comparisons made between Dagney Taggart and Sarah Palin, another example now comes to mind. I’ve often pointed to one Republican candidate I could support who unfortunately is fictional–Arnold Vinick on The West Wing. Regarding Palin moving to the Senate (as one reader pointed out by email), current state law requires a special election. She could not have appointed herself (unless she could find a way around that law) but I assume she would have been a strong front runner if she decided to run in a special election.